The article investigates arbitrage opportunities in Indian cash and derivatives equity markets over the 6 months from November 2008 to April 2009 using three strategies � box spread, conversion-reversal and cash and carry arbitrage. While the study suggests that the Indian derivative markets are efficient, it also shows that they provide some arbitrage opportunities. We found that box spread provides more arbitrage opportunities than conversion-reversal; however, cash and carry arbitrage is more popular owing to its simplicity and quick trades. Among the transaction costs, Securities Transaction Tax (STT) forms the largest cost component and hence, a kind of spoilsport in arbitrage opportunities. We were curious about the possibility and extent of arbitrage opportunities in equity cash and derivatives markets in the Indian capital markets. While exploring that, we also wanted to analyse the components of transaction costs and identify which component was the major contributor to the transaction cost. This article is a result of our primary research to find arbitrage opportunities in National Stock Exchange (NSE) cash and derivatives markets. In this article, we will talk about our findings from out study starting with box spreads and then proceeding to transaction costs and their impact on box spread results. Application of conversion�reversal strategies, which combine a stock with the proxy of stock�s payoffs created using options on the same stock, will be covered next. The arbitrage opportunities in Futures will follow that. We will also highlight upon some arbitrage opportunities used in the real world by means of an interview with a trader. A box spread involves buying a bull spread and buying a bear spread. 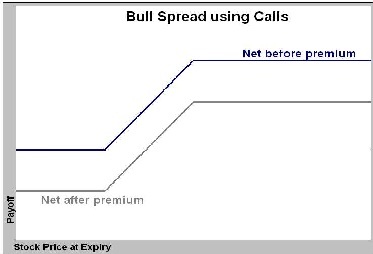 A Bull Spread is created by buying a call option with a low exercise price and selling another call option with a higher exercise price (the Z-shaped payoffs of a call bull spread are shown in Exhibit 1). Alternatively, one can also create a bull spread using put options by purchasing one put option while simultaneously selling another put option with a higher strike price. A bull spread buyer expects asset price to rise. Doing converse of the above gives a Bear Spread, under which case the buyer of bear spread expects the prices to fall. Its payoff forms a mirror image of letter Z. As shown in Exhibit 2, this strategy gives a riskless profit of Rs 1.85 at any closing stock price. Alternatively, doing the reverse can also create a bear box spread, i.e. As shown in Exhibit 3, this strategy gives a riskless profit of Rs 4.6 at any closing stock price. We tried different combinations of exercise prices for Reliance and NIFTY and found three arbitrage opportunities in Reliance (gain ranging from Rs 1.85 to Rs 4.5) and eight arbitrage opportunities in NIFTY (gain ranging from Rs 2.7 to Rs 10.85). Securities Transaction Tax (STT) - Depending on the instruments traded, STT charges may vary from 0.017% or 0.125%. Interest - We assumed interest cost at the rate of 1.5% per month for funding the upfront payment of premium or margin money or proceeds to buy a stock. Brokerage (including Service Tax) - Market usually charges brokerage at the rate of 0.01% of exercise price and service tax at the rate of 12.5%. In case the person carrying out the arbitrage strategy is a broker himself, he will save this cost. 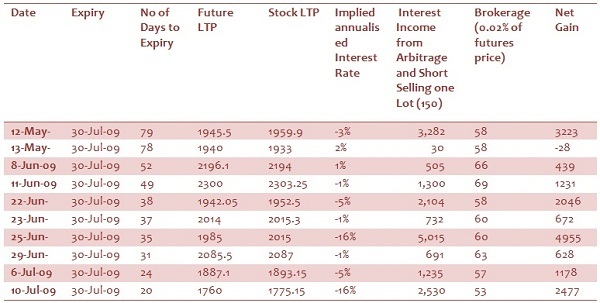 Interest on Margin Money - Option writer has to pay margins to the extent of 10-20% of Exercise price. No margin requirement exists in the case of an option buyer. We have taken the interest @1.5% per month as transaction costs. Transaction costs, particularly STT, eroded most of the gains. However, a few strategies could still generate gains even after these costs. Exhibit 4 shows a summary of the payoffs. Bear box spread will normally show higher net gains because it generates net premium income in the hands of the arbitrager. However, to be conservative, we have not taken interest income on this premium receipt. Exhibit 5 denotes the number of arbitrage opportunities that existed after considering the above transaction costs on all the NIFTY options combinations with a minimum volume of 100 contracts per day between November 2008 and April 2009. Exhibit 6 denotes the number of arbitrage opportunities that existed after considering the above transaction costs on all the NIFTY options combinations with a minimum volume of 100 contracts per day between November 2008 and April 2009. Inference: Bear box strategies tend to throw more arbitrage opportunities. Rationale: The arbitrager received a net premium in case of bear box spread and hence, we can save the interest costs on net premiums. Conversion and reversal strategies create synthetic stock payoffs, which should be identical to actual stock. In case it is not identical to actual stock, there arise arbitrage opportunities. This is the conversion strategy. Conversion strategy leads to net payoff of Rs 9.4 (Exhibit 7) irrespective of actual stock price. We tried different conversion strategies for various combinations of exercise prices for popular stocks and found 4 arbitrage opportunities in Reliance, 5 arbitrage opportunities in Reliance Natural Resources Limited (RNRL) and 2 arbitrage opportunities in National Thermal Power Corporation (NTPC). The following depicts a specimen strategy (using Reliance bhavcopy3 as on June 15, 2009) that gave positive payoffs after considering transaction costs. Following graph (Exhibit 8) denotes the number of arbitrage opportunities that existed after considering the above transaction costs for carrying minimum contract sizes (20). A comparison of box arbitrage and conversion arbitrage thus shows that number of opportunities is more in box arbitrage than in conversion arbitrage. The forward price represents the expected future value of the underlying asset discounted at the risk free rate. Thus, for a simple, non-dividend paying asset, the value of the future/forward, F(t), will be found by compounding the present value S(t) at time t to maturity T by the rate of risk-free return r.
We can modify this relationship for storage costs, dividends, dividend yields, and convenience yields. We looked for instances where this ideal pricing principle was not met and which could be exploited as an arbitrage. We interviewed one of the partners of a pure arbitrage firm, operating in Mumbai. We enquired him on the real world arbitrage practices. The most often-used arbitrage strategy by this arbitrage firm is between cash and carry and reverse cash and carry. This was owing to the simplicity in carrying out trade. Option strategies needed multiple instruments to construct the trades. As per the study, while the Indian derivative markets are efficient, however, they do provide some arbitrage opportunities. Among option arbitrage strategies, Box spread arbitrage strategies tend to give more opportunities than the conversion/reversal arbitrage strategies. As regards the Futures market strategies � price differential between cash and futures market, interviews with traders and arbitragers showed that most of the arbitrage play in India is concentrated on the largely traded future contracts such as Nifty and Reliance. Among the transaction costs, STT (Security Transaction Tax) forms the largest cost component and hence, a king of spoilsport in arbitrage opportunities. This could possibly be one of the reasons, why there was a resounding demand in the Union Budget (2009) to scrap STT. V. Ravi Anshuman is a professor in the Finance and Control area at IIM Bangalore. He is Bachelor of Technology (Mechanical Engineering) from IIT Kharagpur and holds a Ph D Finance from University of Utah, USA. He can be reached at anshuman@iimb.ernet.in. Vikas Dugar (IIMB, PGP 2008-10) is a Chartered Accountant and Chartered Financial Analyst and can be reached at vikas.dugar08@iimb.ernet.in. Sumit Sarda (IIMB, PGP 2008-10) is a Chartered Accountant and Company Secretary and can be reached at sumit.sarda08@iimb.ernet.in.